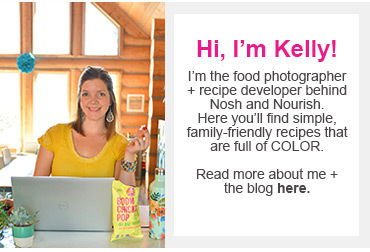 Hello, Nosh and Nourish readers! Lunches + Littles here with a new recipe that is perfect for the weekend, or any day of the week: Sweet Teriyaki Chicken Rainbow Skewers. What I love about these skewers – aside from their delicious flavor, of course – is that they can be cooked up on the grill, which is perfect for those hot summer nights when you just do not want to turn on the oven. Anyone else feel me? This heat is no joke! Something else I love about them: All. The. Colors. Yeah, you probably know this by now, but goodness - I love color, and like to surround myself with it; from walls, to clothes, to home décor – I would choose colors over neutrals any day of the week. And, what is on my plate is no exception! Have you ever heard the phrase, “You eat with your eyes first.” Well, it’s true… don’t you think? And, as a mother I have always believed that colorful plates are a must - especially for kids. 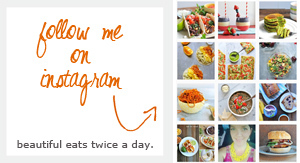 And if you have been following Kelly for any length of time at all, you already know that she too loves all the colorful things, especially when it comes to food. I just love that real food can be so fun and colorful. And today I am excited to be adding to our list of colorful recipes with these Sweet Teriyaki Chicken Rainbow Skewers. 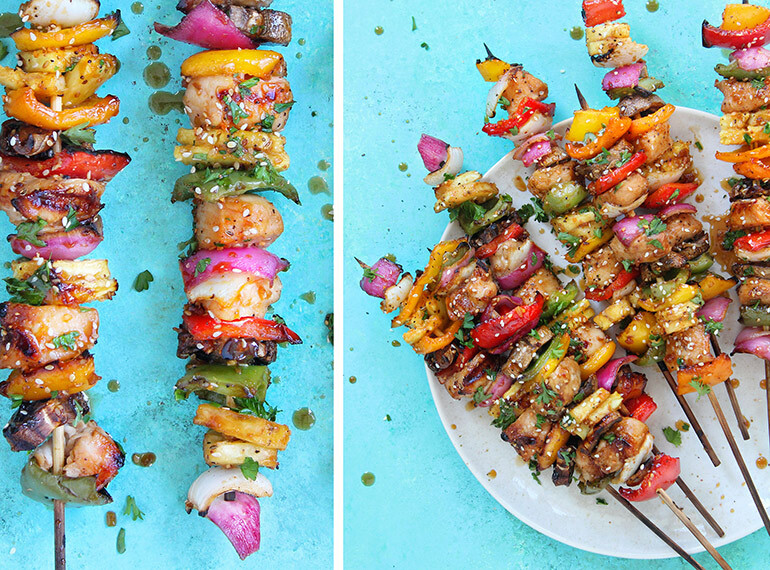 They’re colorful, full of flavor and veggies, and basically- a rainbow on a stick. Which of course, we both love. The homemade teriyaki sauce has hints of garlic and ginger, is sweet and so tasty – we always make a little extra in our home so that we have some for dipping. These Rainbow Skewers are a fun way to introduce new veggies to your little ones, or win them over with veggies presented in a new way. Everything is more fun on a stick! And you know how we feel about cherries. 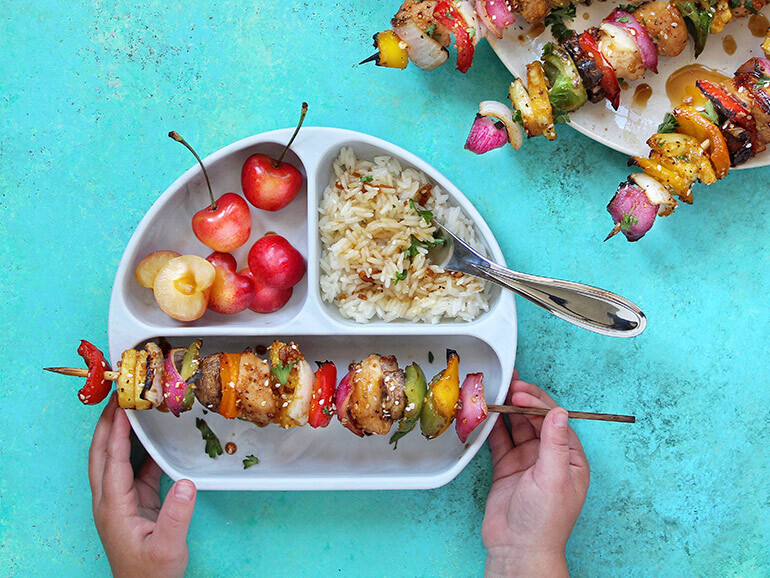 These skewers are super easy to prep, perfect for throwing on the grill for family and/or friends, and fun for little ones too! And as a bonus this meal can be prepped ahead of time. So, if you have a busy day ahead, you can prep early and then just come home/finish what you are doing and grill these skewers up! Read on for the full recipe and enjoy this fun and colorful family favorite of ours. Yummmm. 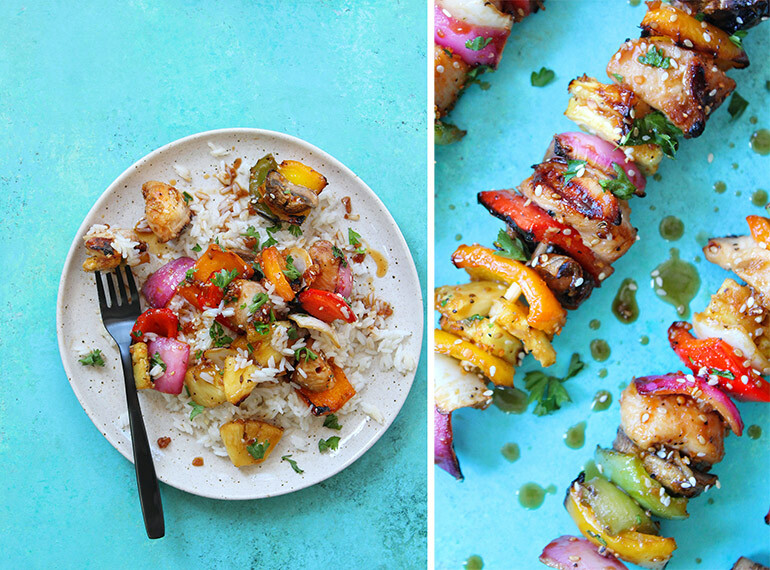 Whether you serve these Sweet Teriyaki Chicken Rainbow Skewers up as is, with a side of rice, or even deconstructed on a bed of rice, you just can’t go wrong. Cut chicken breasts into small bite-sized cubes and set aside. In a mixing bowl, combine all the sauce ingredients. Whisk well. Set aside. Pour about 1/2 of the marinade over your chicken in either a shallow dish (with cover) or resealable bag. Move chicken around to fully coat the pieces. Allow chicken to marinate for a minimum of 1 hour in the refrigerator. While chicken is marinating, cut up your peppers, onion, pineapple, mushrooms, etc. if you haven’t already. For extra flavor drizzle a little marinade over the cut produce and allow to sit a couple minutes. While grill is heating up, thread chicken, pepper, onion, pineapple and mushrooms on skewers in whatever order you would like, or just be random. Coat skewers with additional teriyaki sauce as desired. Next, place threaded skewers on grill. Grill for 8- 10 min. until chicken is cooked to desired liking, flipping half way through. Using a sauce mop or brush, coat with additional sauce during cooking, as desired. Remove skewers (be careful!) from grill and transfer to a plate. Sprinkle with fresh chopped parsley and/or green onions and/or any additional seasonings, salt/pepper, sesame seeds, etc. as desired. Enjoy with rice on the side, deconstructed on a bed of rice, or eat right off the skewer!